A couple of weeks ago I posted an article called "Move away from the Workflow Tasks with Nintex for Office 365". The goal of this post was to show some key techniques that you can use if you want to automate a process without using tasks and do all the work in the form so users can see what they are approving. However, if you want or need to stick with the tasks there is way to display and fill fields from the related item in the task form. To do this you will need to edit the task template from the workflow designer. This feature was introduced with July 2015 release of Nintex Forms for Office 365. To illustrate how this is working I am going to use the familiar simple Vacation Request form. See how it looks in the form designer below. You can see a field with label "Manager Comment" this field is visible only when the form is not in "New Mode", it should contain some information from the manager that will approve the request. In Nintex Workflow for Office 365 there is no Request Data action, but we can include the field that requires information on task completion in the task form. If you open a Assign a Task(or Start a Task Process) action configuration page you will see "Edit Task Form" in the action ribbon. By clicking it you will get to the familiar Nintex Forms Designer interface. 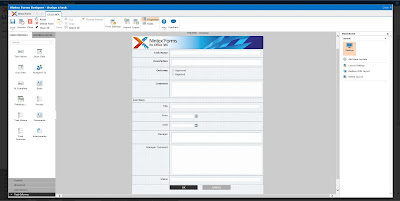 In the picture above I am editing the default Nintex task content type and once you open the form designer the initial form includes task columns and item column. Initially all related item columns are disabled, but you can change that for any column you want and make it editable in the task, you can also connect control from the task form to related item column. With some rearrangement you ca see how the Vacation Request approval task looks below. There is something you should consider if you have many tasks with modified forms. This is something I hit with a customer and later reproduced. This is not yet confirmed by Nintex. When you edit a task form, the task will be created with Nintex content type(ending with GUID), even if you have specified your own custom content type. This is not an issue because the Nintex content type will have the same columns as the original. However you will have to edit all Task Action forms in the workflow regardless of what content type they are using. If for example two tasks have the same initial custom content type, they will be created under the same Nintex content type after you edit both forms. This is still not a big deal. However, every time you edit a task form two hidden variables are created and you can easily end up hitting the variable count limitation in the Workflow Manager which is 50 in SharePoint Online. See below error when you try to publish a workflow that has more than 50 variables. Error publishing workflow. Workflow XAML failed validation due to the following errors: Activity 'DynamicActivity' has 52 arguments, which exceeds the maximum number of arguments per activity (50). HTTP headers received from the server - ActivityId: 9e1fc3bc-5a7c-4821-9605-d595acea851d. NodeId: . Scope: . Client ActivityId : 29ca419d-d068-2000-213e-aae9dfcc2677. The remote server returned an error: (400) Bad Request. This is not an issue with Nintex, this is just the way the things are working in the background. In my humble opinion Microsoft should rethink this limitation in SharePoint Online! Happy to add that the variable limit has now been lifted considerably, so should no longer be an issue.